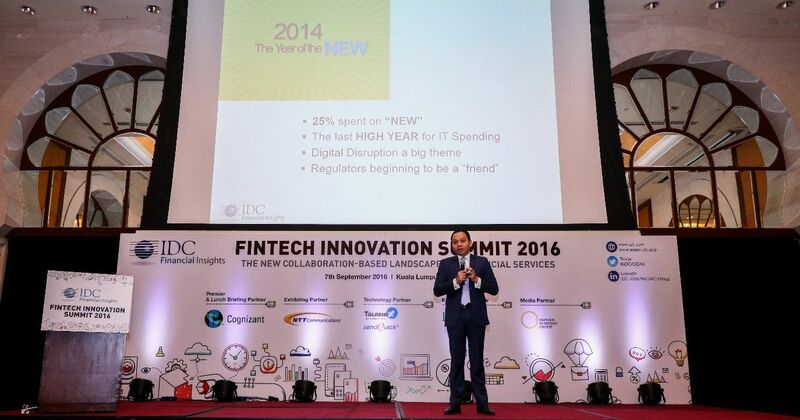 KUALA LUMPUR, September 9th, 2016 – IDC hosted its annual Fintech Innovation Summit at the Sheraton Imperial hotel on September 7th 2016. Titled ‘The New Collaboration-Based Landscape for Financial Services', this summit explored the opportunities and threats of today’s increasingly open ecosystems for technological and business partnerships. The convergence of innovation and multi-disciplinary partnerships across industries has created an unprecedented impetus for value co-development, and Malaysia conceived many champions of its own. Michael Araneta, Associate Vice President – IDC Financial Insights Asia/Pacific, delivering his keynote on Fintech Strategy and innovation in Asia. In this fast-paced digital world, many enterprises are leaning on the Digital Transformation (DX) platform as a way to ensure the timely delivery of services while also minimizing the complexity and costs involved. Today's financial services have to innovate further, using early digital victories as foundation to push the boundaries. Digital financial services have become part of what the customers expect from financial institutions so going beyond current digital strategy is the key to success in the next two years. For this to happen, financial institutions will need to use a new set of innovation accelerators, foster new partnerships, and embrace concepts of openness and collaboration. Building a new ecosystem of partners out of your industry. Financial institutions will have to re-imagine a new value chain for the customers where banking and insurance needs to interface with manufacturing, or retail, transport or telecommunications to offer a whole new proposition of products/services to the customers. Supporting industry-focused developers and create innovation communities that are fundamentally remaking what financial services fundamentally does. Responding to new customer segments that do not separate "banking" from other activities in their everyday lives, so that banking (or insurance) becomes integrated to your customer's lifestyle. Embracing partners in an era of unprecedented collaboration, so that banks, insurers, regulators, Fintech start-ups, tech vendors and customer advocates remake financial services as we know it. Breaking down the barriers to ideas and innovation within your institution, recognizing that change does not come only from the top. "Innovative incumbent banks and financial institutions are moving rapidly to embrace digital. They need to go the distance in addressing not just the strategic but also the human challenge. Beyond that, to truly transform, they need to start thinking beyond digitization and incremental improvements", says Michael Araneta, Associate Vice President – IDC Financial Insights Asia/Pacific. "Creating strategies need to be based on a clear understanding of how digital creates perspectives and value on consumer ecosystem. Fintech Innovation Summit 2016 was a right platform that gathered the financial leaders and practitioners who shared their experience on digital transformation journey, Araneta adds. Fintech Innovation Summit 2016 brought together regional industry leaders and prominent financial experts across verticals in Malaysia. The holistic insights offered at this event is not only oriented towards helping the financial leaders plan their strategy in advance to deliver solutions that meet the challenges of today’s dynamic market conditions, but also in establishing altogether-new standards in the use of IT. It will also make a stop in Bangkok and Jakarta on September 22 and October 13.